Thank you for producing such great products. The floor pans, inner and outer rocker panels, rear quarter extensions and the rear quarter patch panels you sent me for my 1957 Thunderbird all fit perfectly. As a result of this fit, it was much easier and took a lot less time to install them than I had anticipated, also I want to thank you and your staff for giving me personal attention concerning some technical questions I had. Keep up the good work. Enclosed are some pictures of my 1970 bird during and after replacing quarter panels with your product. The car always looked good, but now it looks GREAT!! The body shop was very complimentary of the quality of your panels, especially the detail (i.e. the small lip on the lower bottom edge of rear quarter). I also passed along your catalog to another guy who has a 1964 convertible. Keep up the good work of helping save T-Birds! Call me if you need any other information. I think your sheet metal products are great! 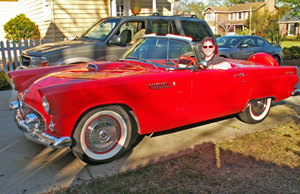 I have been restoring old cars for twenty-five years and have seen all types of workmanship and quality. Most of the true craftsmen are dead and gone and have been replaced by a much less skilled type of workmanship. I have fought with panels that did not fit and that were poorly formed and I have a constant problem with inadequate chrome plating. Upholstery people cannot seem to sew a straight line. It seems to be the norm these days. Therefore, it was refreshing to receive your fine quality panel for my 60 Thunderbird. Your panel is an appropriate gage and the fit and forming is outstanding. Thank you for taking the time and having the desire to produce a very nice quality product. Hi Guys, I’m the fellow who stopped in to pick up the quarter panel on my way home from Cocoa Beach to Ontario in late March. I just wanted to let you know the restoration project turned out great – thanks to your excellent sheet metal. My body guy was very impressed. I will send photos of the finished product when I get some. A note from our President? Not Obama. Please fill out this form so that we might contact you about special deals!